If you’re a nursing student, you already know that to become a nurse you have to pass the National Council Licensure Examination, or NCLEX-RN. Passing the NCLEX-RN exam can be a daunting prospect for would-be nurses. But try to keep this in mind: if you’re graduating from a qualified nursing school, you are already equipped with the knowledge and skills necessary to become a competent nurse. Preparing for—and passing—the NCLEX-RN is just another chance for you to prove to yourself what you are capable of. In any given year, 90% of Ameritech graduates pass the NCLEX-RN exam the first time. 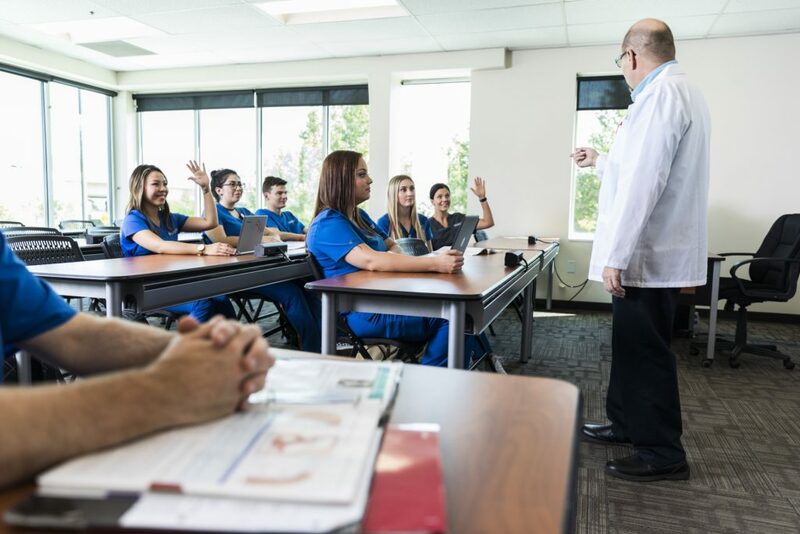 Over the years, we’ve developed a strong repertoire of tools to help students successfully complete the exam and get started on their nursing careers. Preparing for the NCLEX-RN isn’t just about knowing what will be asked on the exam. It’s also about knowing how the test is structured and developing good test-taking strategies based on that knowledge. With those strategies in place, a robust study plan, some stress management, and lots of practice, you’ll have all the tools you need to successfully pass the NCLEX-RN exam. Check out our helpful tips below to get started. The amount of time you’ll need to study for the NCLEX-RN will depend on how well your nursing program prepared you for the exam. If your school includes a strong NCLEX review course like Ameritech’s program, you’ll likely be ready to schedule your test upon graduation. Typically, you can register for the exam starting six weeks before your program ends. If your nursing program did not include a NCLEX review, you’ll likely want to dedicate anywhere from a few weeks to a few months to prepare. As the exam and licensure fees typically cost around $300, you don’t want to risk losing money by taking the exam before you’re ready. As is true in the nursing field in general, you do need to continually challenge yourself. Don’t give yourself too little time to study, but do schedule the exam in as short a time as you need to pass it and start your nursing career. When you develop your study plan (which we’ll cover a little later in this article), it should become pretty clear how much time you’ll need to prepare. Schedule your exam accordingly, and the impending due date will help you maintain your commitment to your study plan. Finally, make sure to schedule the time of your exam (early morning vs. afternoon) based on when you focus best. As you may know, the NCLEX-RN is not structured like the exams you took in nursing school. Understanding how the exam works will help give you the tools you need to ace the exam. The NCLEX-RN is administered using computerized adaptive testing (CAT). The test is dynamic (which means no two test-takers get the same exam), and it adapts as you answer each question. The questions start easy, and the more you answer correctly, the harder they get. When you answer questions incorrectly, the questions will get easier until you begin to answer those correctly, which will lead to the questions again increasing in difficulty. The exam is designed to gauge the level of difficulty of questions you can consistently answer correctly. If you can continually answer questions above a certain baseline, you will pass the exam. The use of CAT also means that the NCLEX-RN has a variable length. To pass the test, you must answer at least 75 questions correctly, and you will not be asked more than 265, which means the test may be comprised of anywhere from 75 to 265 questions. If you end up having to answer more than 75 questions (as most test-takers do), don’t despair! If the test is still going, that means it is still possible for you to pass. Being a nurse is not just about learning how to provide healthcare; it’s also about knowing how to maintain a proper care delivery setting. This section of the test is divided into two subsections: Management of Care and Safety and Infection Control. Nurses provide care that incorporates the knowledge of growth and development, health, and prevention. This section of the NCLEX-RN will test your knowledge about birth, newborn care, and aging. It covers screening, disease prevention, healthy lifestyle choices, and potential risk behaviors. Nursing involves providing care that promotes and supports the emotional, mental, and social well-being of the client. This category includes questions about chemical and substance dependencies and disorders, mental health, cultural awareness, family dynamics, and stress management. This section of the exam tests your knowledge about promoting physical health and wellness by providing care and comfort, reducing client risk potential, and managing health alterations. It is the largest section of the NCLEX-RN, and is divided into four subsections: Basic Care and Comfort, Pharmacological and Parenteral Therapies, Reduction of Risk Potential, and Physiological Adaptation. As you prepare for the NCLEX-RN exam, pay attention to which categories present the most challenges to you. Many practice tests will allow you to focus on questions from specific categories to help improve your expertise. Taking practice tests is one of the most effective ways to prepare for the NCLEX-RN exam. Practice tests familiarize you with the exam structure, introduce you to more content, help you develop strategies for choosing the right answer, and provide insights into your strengths and weaknesses. The more practice tests you take, the more prepared you will be for the exam. Luckily, there are many great resources for free online practice tests, including Kaplan Nursing, Khan Academy, and Nurse Plus Academy. To get the most out of your practice tests, make sure to read the questions carefully, look up the answers to questions you got wrong, read the rationales for the correct answers (including the ones you answered right), and take notes on which areas to revisit. The exam is set up so that you have exactly 1.3 minutes per question. Try to spend about a minute on each question, and if you haven’t answered the question after two minutes, move on to the next question. If you’ve already answered the question, try not to second-guess yourself and change your answer. Unless you’ve had a flash of inspiration, you will most likely switch to a wrong answer. Trust your instincts and stick with your first choice. If, for example, you answer option C three times in a row, don’t doubt yourself. Remember that the order of answers is randomized by the computer. So, while it may seem like you’re seeing a consistent pattern, it’s likely just a random coincidence. After you’ve answered a question to the best of your abilities, move on. You can’t go back and change your answer later, so it’s best to forget about the question once you’ve answered it, and approach the next question with a clear mind. Successfully preparing for the NCLEX-RN exam is less about the amount of time you dedicate to studying and more about how you use that time. Developing a strong study plan with specific goals will ensure that you make the most of your test prep. Figure out the type of study schedule that works best for you—some people like to study in intense short periods, while others like to weave in their study throughout the day. Based on your learning style, create a schedule with specific days or chunks of time dedicated to reading materials, taking practice tests, or reviewing your notes. Set goals for every study session (such as answering a specific number of practice questions, learning a specific content topic, etc.) to keep you on track. Also, be sure to include breaks as part of your study plan, so you don’t overtax yourself. As you develop your study plan, make sure to incorporate active—not passive—methods of study. Rewrite notes in your own words, vary your learning methods, test yourself, and find opportunities to teach the material to someone else. In addition to helping you learn new materials and giving you the chance to teach what you’ve learned to others, working with a study group will also equip you with a support network. Studying with your peers provides an important reminder that you’re not alone in preparing for the test that is a landmark in every nurse’s career. Cramming and all-nighters won’t help you retain information, and lack of exercise and a poor diet won’t put you in the right state to excel. Make sure to schedule periods in your study plan for exercise, sleep, and the time to eat proper meals. Exercise can help relieve stress, while getting enough sleep, maintaining a healthy diet, and exercise can all improve memory. Make a commitment to treat yourself with compassion. Anxiety is a normal part of the process of preparing for the NCLEX-RN exam, and it is OK to feel stressed out. But try to maintain a healthy work/life balance—take breaks, make some time for friends and family, and practice good self-care. The most effective way to counter stress about the NCLEX-RN exam is to give yourself sufficient amount of time to study thoroughly and appropriately. When you utilize the best methods available to prepare for the test, you’ll likely find that the prospect of taking the exam becomes less daunting. As your scheduled appointment for the NCLEX-RN approaches, take some time to plan for the day of the exam. Try not to cram the night before—if you’ve utilized the above tips, you’ll have already put in the effort you need to pass the exam, and cramming will only increase your anxiety. Get plenty of sleep, so you can arrive to the exam well-rested and as relaxed as possible. On the day of the test, show up early with all of the documents that you need. Wear comfortable clothing and bring layers in case you get cold. Eat before the exam and bring water, as well as snacks to keep in your locker in case you take a break. Taking the NCLEX-RN exam may seem like a daunting prospect, but with sufficient preparation time and the right tools, you can pass it successfully. At Ameritech, we are dedicated to equipping our students with all the tools they need to pass the exam. That’s why we developed a free eBook, 49 Proven NCLEX Strategies, chock full of helpful tips and tools for passing the exam. Our eBook includes an overview of the types of questions that will be asked on the NCLEX-RN, tips for calculating measurements, specific strategies for answering the different types of questions on the exam, and lots more. Want more NCLEX-RN exam tips and strategies? Download our free eBook now.